2014 dawned …. Was it another ordinary day… ? 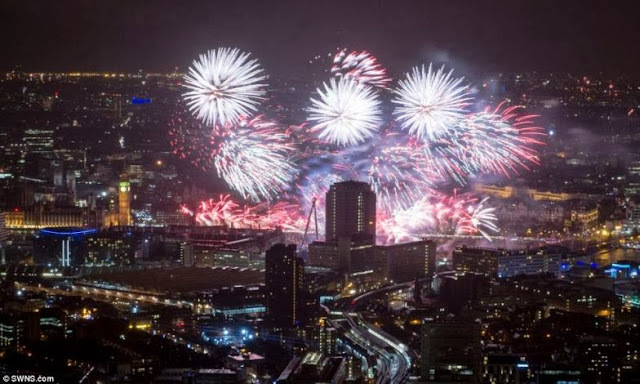 – coming as it did, it dawned at various times over the globe…….. ~ and the midnight did set off dazzling celebrations for 2014 around the world. Going by a report in Daily Mail - revellers in New Zealand started the celebrations, dancing in the streets of Auckland and Queenstown. In London, 250,000 spectators lined the Thames as the London Eye was transformed into a giant Catherine Wheel. They were also treated to peach snow, banana confetti and orange-flavoured bubbles which fell on the crowd. Police made 100 arrests by 4.30am following celebrations in London but said crowds were 'good-natured'. Dubai attempted to break record for biggest ever fireworks show with Guinness World Record judges on hand. Display included 500,000 fireworks set off from 400 locations and synchronised by 100 computers. More than one million people pack Sydney harbour to watch the spectacular fireworks display burst into the sky. Bright rockets flew from the four sails of the city's iconic Opera House for the first time in more than a decade. More than 260 people injured as firecrackers are set off in the Philippines during the countdown to midnight. These make an interesting read ….back home, on New year eve, roads leading to Kamarajar Salai (Beach Road) in Chennai were blocked by Police putting up barricades - people returning home had to wind through narrower lanes, crowded more … the City Police regulations for the Public read : No bursting of firecrackers in crowded places; Any form of eve-teasing will be severely dealt with; The public shall refrain from throwing coloured powder/coloured water on others; Drunk drivers will face legal action and their vehicles will be confiscated; Speeding on two wheelers and cars will also be severely dealt with; The public shall refrain from getting into the sea or getting on to boats to venture into the sea. In life there are things which change without you having to do anything… time is one … new year beckons as time flies past. A few decades ago, New Year would usher in with hundreds of ‘Greeting Cards’ personally written wishes from relatives and friends that would make one happy. That was the time when people thronged Post Offices for Post cards, Inland letters and covers – are they still in use ? – then e-mail took over ; now sending e-mail is considered old-fashioned in the era of Facebook, twitter, Whatsup and other medias. Most telephony providers hike or charge special rates on festival days and the messages do get delayed due to overload of traffic. In Chennai, [perhaps the same story in many other Cities in India] every year, there is the ungainly sight of New year revellers partying and spoiling the day of others . This becomes the time when Police, Paramedics are kept on toes as cops struggle to keep the inebriated under bay. This is nothing new and recurs year after year – Mount Road Buhari Hotel, Beach Road , Elliots beach, ECR – the list is only expanding – mobs gather and as the clock strikes, the drunken mobs revel causing inconvenience to everybody and themselves. As youngsters drive mad, some accidents get reported and Emergency services and Police are kept on their toes.. why this kolaveri ? – what sort of pleasure is this ?? Now getting back to the same photo that you saw first ~ a closer look – would reveal – it is parked on the wrong side – is damaged and is left unattended – most probably its rider was drunk, drove wild, caused an accident, injured himself, perhaps injured somebody else too…… could have been hospitalized – not knowing where the vehicle presently is and perhaps for some more hours none would care for…. In the morning of 1st Jan (with Sun yet to rise above shoulder level) – a group of youths in half a dozen motorcycles sped past near PWD – there was that thudding sound – one vehicle with 3 on it had fallen – at least two of them were seen rubbing all parts with some bleeding injuries - the rest group were still laughing – not caring to lift the fallen youth ! – those passerby also felt numb and not needed to go near and offer any help……. ‘wild New year celebrations’ !! If you felt this post to be too cynical…. You must read this report in The Hindu, Chennai edition too before deciding ……………. - After two years of fatality-free New Year celebrations, the city and its suburbs witnessed five deaths in road accidents on New Year’s eve on Tuesday. Rash driving proved fatal for some of the revellers. 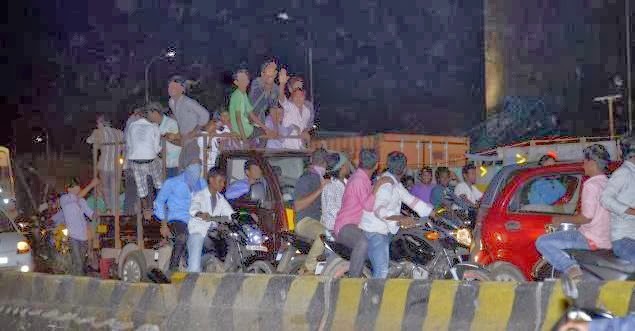 P. Ramprasad (19), an engineering student, died after his bike rammed a lorry on the Sardar Patel Road flyover. He and his friend Saravanan, who was riding pillion, were headed to Besant Nagar beach. While Ramprasad died on the spot, Saravanan sustained injuries. In another accident, Ramanarayanan (42), an employee at a hotel in M.K.B. Nagar, died after the two-wheeler he was riding was knocked down by a lorry near Basin Bridge. He was on his way to Washermenpet to celebrate New Year with his friends. Lorry driver Muthuvel (32) was arrested and remanded. Arun Kumar (17) of Kundrathur and Anbuchelvan (25) of Arumbakkam died in two separate accidents. 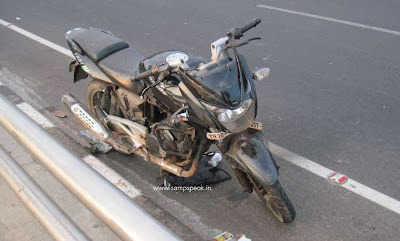 While Arun Kumar’s bike hit the median on Vandalur-Minjur Road while he was on the way to buy a cake, Anbuchelvan’s bike was hit by a lorry near Vellapanchavadi. The lorry driver Sivakumar was arrested and remanded. Around 4.30 a.m. on Wednesday, Sekar alias Dhandayudhapani, a 23-year-old man, who was returning after attending a New Year’s party in Maraimalai Nagar, died after he fell from his bike on the Tambaram Bypass Road. Two of his friends, who were riding pillion, were injured. Meanwhile, R. Balachandar (32) of Otteri, who was on his way to a party, was injured after a bottle of alcohol he had tucked in his waist shattered and pierced his abdomen after he fell from his two-wheeler on Perambur Barracks Road on Tuesday night. The accidents on New Year’s eve kept the staff at government hospitals on their toes. Doctors said most of the cases were related to road accidents. The casualty ward of Rajiv Gandhi Government General Hospital received a total of 69 cases since midnight. Of this, 37 persons sustained injuries in road accidents, while the others were injured in assaults and falls. At the Government Royapettah Hospital, 50 persons reported with injuries after midnight. 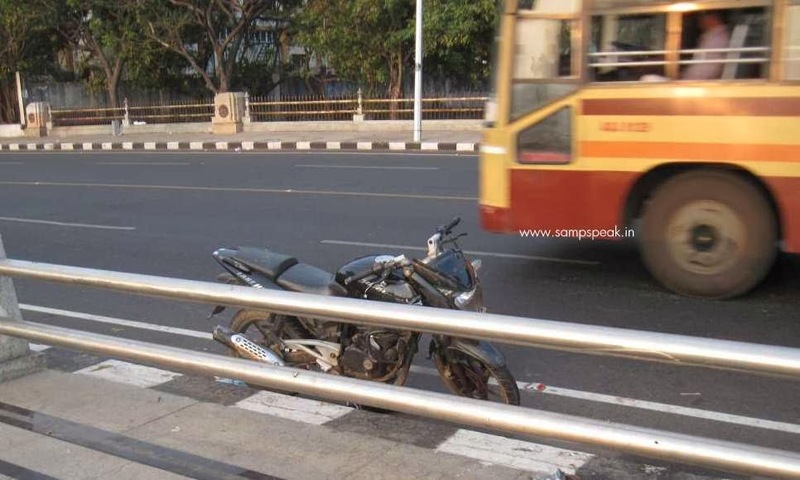 “Complaints were lodged for about 30 cases, while many others claimed that they sustained injuries after falling from their two-wheelers. A majority of them were in the age group of 20-24 years. At the Government Stanley Medical College Hospital, 25 persons were brought in for treatment of injuries between 11 p.m. on December 31 and 3 a.m. on January 1.